Lowbush blueberry shrubs thrive in the thin, smelter-damaged soils found in abundance here along with acid-tolerant lichens, mosses and white birch. Lowbush blueberry, with the scientific name Vaccinium angustifolium is a member of the plant family Ericaceae commonly known as the heath family. It is a low-spreading deciduous, perennial shrub growing to 60 centimetres tall, but near Sudbury it is usually 35 centimetres tall or less. There are actually two species of blueberry shrubs in the Sudbury area; the second is Vaccinium myrtiloides, less common than V. angustifolium and distinguished by the fuzzy surface of its leaves compared to the smooth surface of angustifolium. A third species, the northern highbush blueberry Vaccinium corymbosum, has come onto the market over the past few years. This shrub has been transplanted to farms and grown in rows like apples in an orchard. These are the berries found in grocery stores and they’re not as sweet as lowbush blueberries. First Nations people held blueberries in high esteem, because the blossom end of each berry forms a five points star and it was believed the “Great Spirit” sent these star berries to relieve the hunger of children during a famine. Aboriginal people likely have been feeding on ripe berries cheek to jowl with black bears in the Sudbury area for millennia. Our lowbush blueberry is a fascinating shrub. It thrives in acidic, rocky places with thin soils, which lucky for us, it finds amply abundant in the Sudbury region. It grows naturally as an understory plant and is an early successional species in both natural and man-made forest clearings from this part of Ontario to Newfoundland. They are long-lived perennials. Given the right conditions, they theoretically can live forever. Sudbury’s blueberries commonly grow in close association with stunted white birch trees and it appears they benefit each other. The intertwined stems of the shrubs make dense mats which accumulate birch leaves in the fall. Dead leaves help protect the ground from overheating in the summer and retain moisture. The thick leaf litter also provides good sites for birch seedlings to become established. Blueberry shrubs reproduce sexually using flowers to produce seeds or vegetatively by making copies of themselves. Blueberry flowers are white, bell-shaped structures that grow in clusters early in the spring. Flowers must be pollinated by insects in order to produce fruit. Shrubs trick insects such as bees and flies into carrying pollen from flower to flower to fertilize their seeds by providing them with a meal of sweet, energy-rich nectar which is located at the base of the flowers. Insects have difficulty hanging onto the upside down flowers and as they struggle to feed on the nectar, they continue to beat their wings. Pollen is shaken out of the flowers and falls onto the backs of the insects. Called “buzz pollination,” the pollen is inadvertently carried to the next plant. The fruit is eaten by bears, foxes, skunks, squirrels, mice, and many species of birds that disperse the seeds to new sites. Seeds pass through the digestive system unharmed and are excreted in the animals’ droppings far from the place they were eaten. Seeds deposited in this way find themselves surrounded by a fresh supply of fertilizer and if the conditions are right, they will start a new lowbush blueberry shrub. The new plant is called a “mother-plant,” and as it matures over the next two to three years, it sends out underground shoots called rhizomes in all directions in search of water, nutrients and ideal light conditions. This is the second mode of reproduction, the asexual one, where new plantlets arise along the length of the rhizomes. You can eat berries right off the vines, or take them home and gently wash with cool water. Don’t wash berries until right before eating as washing removes the white-gray waxy bloom on their surface that protects them from degradation. 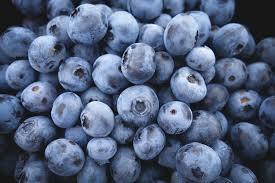 Ripe blueberries can be stored in a covered container in the refrigerator for up to three days. Vendors along most of the major highways on the outskirts of the city are happy to sell you a full basket. Choose blueberries that are firm, dark blue and covered with the bloom. They should be free from moisture since the presence of water will cause the berries to decay. Blueberries can be frozen, without altering their nutritive value, for use in the off-season. Remove crushed or moldy berries to prevent the rest from spoiling before freezing. Frozen berries purchased from the grocery store are usually from highbush plants and not as sweet as lowbush berries. Blueberries contain beneficial plant nutrients such as soluble dietary fibre, minerals, vitamins, and pigment antioxidants that contribute to health and wellness. Their large amounts of iron, phosphorus, calcium, magnesium and vitamin K help build and maintain bone strength. They are naturally free of sodium and contain several minerals that decrease blood pressure. One cup of blueberries contains 3.6 grams of fibre that lowers blood glucose levels in diabetics and lowers cholesterol in the blood thus decreasing the risk of heart disease. There is recent evidence that antioxidants in blueberries benefit the brain and nervous system and improve memory.